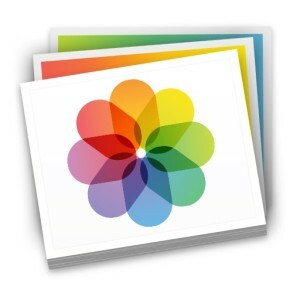 Photos app for the Mac imports images and manages pictures by automatically moving the files into organized folders within the apps dedicated package file. 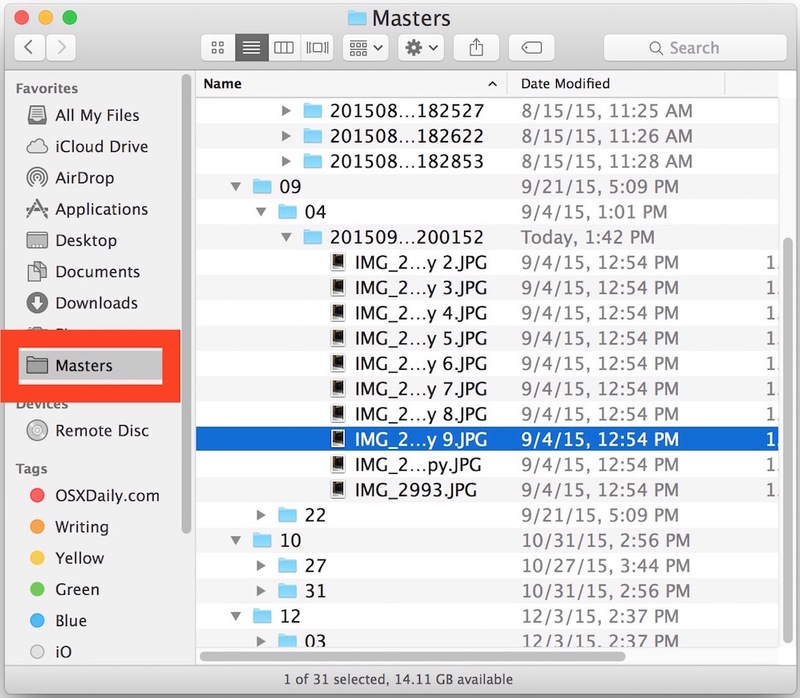 While this file container is not intended to be user facing, many advanced Mac OS users like to have access to the original master files rather than solely relying on the Photos app for image management. One easy method to access those files is by using the Show Original File trick to jump to the Finder location of the master file of a particular image, but if you find yourself using that often, or frequently needing access to the master image files from Photos app in Mac OS, we’ll show a quick and easy way to instantly access those master images from anywhere in the file system in Mac OS. You can now click on the “Masters” item in the sidebar to instantly jump to the master image files found within Photos app, these are the original full resolution files that Photos app copies from iPhone, digital cameras, memory cards, and elsewhere, wherever they have been imported into the application. If you decide you no longer want “Masters” in the Finder sidebar, simply drag and drop it out of the sidebar to remove it. This trick works the same in all versions of Photos for Mac, whether you’re running a modern macOS release or a prior Mac OS X version of system software. 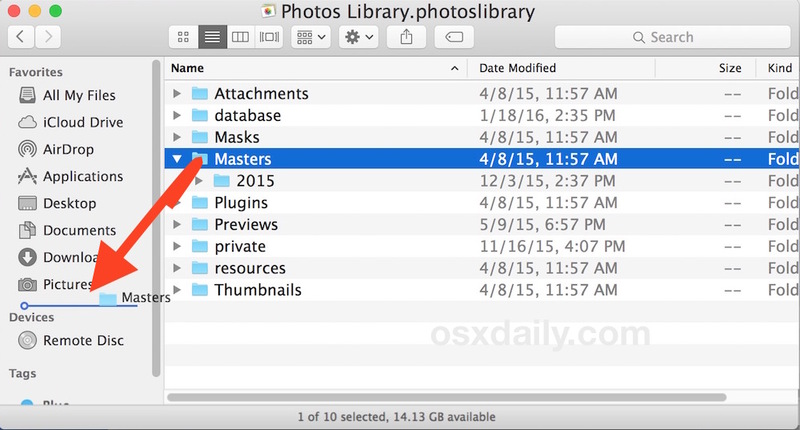 Know of another handy trick to access your originals and raw image files from Photos app on the Mac? Share it with us in the comments. This weird “hidden”, unorganized method of storing important things like photos is one of the many reasons I long ago stopped using photos/iphoto and can’t recommend it to any of my photo taking friends. Aperture was great while it lasted, but now Adobe Lightroom (or a similar DAM) is the way to go for anyone who is even slightly serious about keeping their photos intact and organized. You guys really need to hire a decent editor. The words “apps” and “app’s” convey two wholly different meanings. It’s simple English grammar. This damages your credibility as a source of information. If you’re going to play grammar nazi, you need to verify that “app” is actually being used as a word. Because if it’s only an abbreviation for application, then the plural form is actually “app’s” which moots your point since you’ve implied that “app’s” is a possessive form. There are always multiple valid viewpoints, which makes playing grammar nazi pointless and annoying. This is one in the category “Don’t try this at home”. There’s a good reason for these folders not to be easily accessible to the user. Photo relies completely on their content to be managed by the application itself. If the user changes files, or structure, the database will be corrupted and images and edits get lost. One useful tip is that photos in “Masters” folder appears to be organised by date pictures were *imported* not by the date the image was taken. (and I agree, this should be strictly treated read only). Does anyone know if the copy to iphotos (instead of move) takes advanatage of the apfs space efficiency? IE, duplicates created within APFS no longer take extra space. Apple Photos is a world of hurt. Best tool I’ve found for viewing, cataloging and arranging images (and video) is Pixave. Tagging, sorting, and exporting is fast and simple. The viewer also handles huge collections. The developer’s website has a free trial, and the full app is available in the macOS App Store. Apple seems to forget that these are not their photos. The inability to manage data items that are clearly NOT owned by Apple will cause me to move off of macOS just as I moved off of IOS. « Can’t Open Control Center from Lock Screen on iPad or iPhone? Here’s the Fix!